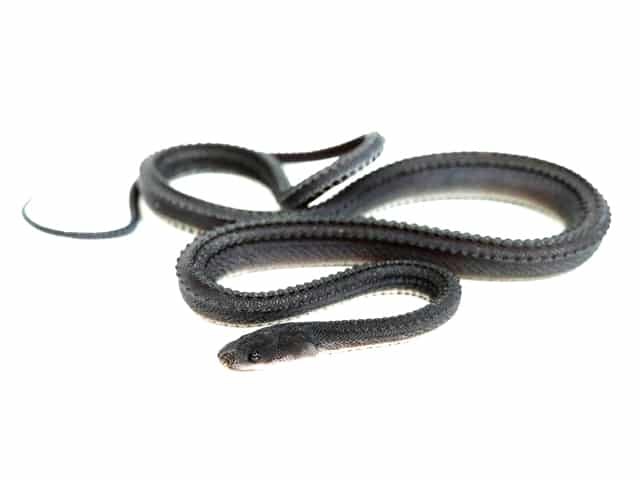 Xenodermus javanicus is an interesting snake in that it is the only snake in its genus. An interesting feature about this snake is its skin. Rather than being smooth as most snakes are, the dragon snake has three rows of large, keeled scales that run down the center of its back. Apparently Xenodermus javanicus are increasing in popularity in the pet trade, so we may learn more about certain aspects of their biology through the keeping of captive individuals. The snakes are being housed separately in enclosures measuring 0.55 × 0.35 × 0.15 meters (1.8 x 1.15 x 0.5 feet) (L × W × H). I use cardboard boxes used for eggs transportation. These boxes were wet at all time. Artificial grass cover (plastic) was chosen for a substrate as it both retains water and stays relatively dry on the surface. I keep my snakes in a dark room all the time. Average temperature is maintained at 24–26 °C (75-79 °F), with no local hot spots. At temperature higher than 29 °C (84 °F), cases of regurgitation were observed. Provide fresh water at all times. It’s preferable to use a container of water which your snake can use for bathing. The exact humidity figures were not taken. But they are a species that require high humidity levels. The main food item was Rana temporaria. For the most part feeding occurred at night, only few feeding were noticed at daytime. Even though the snakes’ heads are large enough to swallow a frog up to 8 g, in case of a lack of frogs of appropriate sizes pieces of frogs were offered and successfully taken. Some Agalychnis callidryas were taken as well. No newborn mice or snails were accepted ever. At 24 – 26°C females fed once in 10 days, at higher temperatures once in 6 – 7 days. It was noticed that females would feed even on early shedding stages. Males fed less frequently, once in 10 – 14 days at 24 – 26°C, preferring smaller food items. These snakes should only be handled when necessary to move them between cages for breeding or to deal with health issues. I spot clean every time I see the need for it and when the enclosure starts to look messy I am doing the big cleaning with changing the whole substrate, cleaning the walls etc. Normally, shedding occurs once in 2 – 3 months, depending on animal’s condition. Taking under consideration that this species requires high humidity levels you need to be careful and allow the substrate to dry up in order to avoid mold. Mold can cause skin diseases to these snakes.